I created this recipe for a formal lunch and it was a success! Especially because it does not contain alcohol washes, and so ideal for children. If you do not have the Pavesini (ie the classic Novaresi cookies, you can replace them with Savoyards, more cookies that lend themselves well to make this cake. 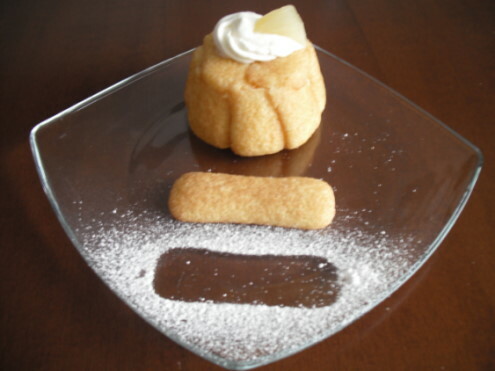 Simply replace Pavesini with half a package of Ladyfingers for the recipe. Addition, the pineapple juice can be replaced with orange juice is well tolerated by children or people who are allergic to pineapple, or other fruit, while inside you can replace the pineapple chunks with mixed fruit, unlimited imagination. So, these mini charlotte Surprise is a versatile recipe that can be enjoyed both in summer and winter, as well as a delicious way to enjoy a lot of good fruit. 6 Prepare the muffin molds like those in aluminum foil and disposable. Whip 200 ml of fresh cream lightly sweetened with very little sugar. Melt in a small saucepan over low heat, gelatin previously soaked in water. mixed with a dash of cream and pour the whipped cream and mix gently. Cut 3 slices of pineapple into small pieces and add to the cream. Pour the chocolate chips and even a bit of pineapple juice, just for a little saporire in the mixture. Open a package of pavesini and break in half a Pavesino at a time, dip in pineapple juice and coat the bottom and sides of the aluminum molds from the sugar cookie. Pour the mixture into the cream and close the surface with 3/2 biscuits soaked in pineapple juice. Exhaust all the ingredients and put the 6 cakes made to rest in the fridge for at least mezzo'ora, or until the mixture you will be well hardened (you'll know because the sweet side of pavesini you will be detached from the walls of the mold.) transform the mini charlotte on the individual plates. Whip the cream liquid remained above. cut into six pieces slice of pineapple and mini charlotte decorate with a sprig of fresh cream and a piece of pineapple.